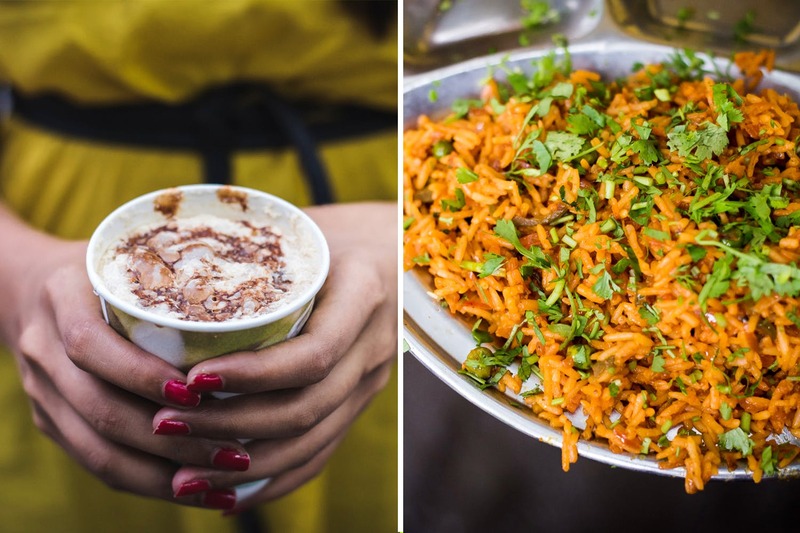 Khau gallis, tucked away in little streets brimming with food stalls, large crowds and serving delicious street-side grub have become a favorite amongst Punekars. We stepped out and discovered yet another street full of food in Model Colony, opposite E-Square, Ganeshkhind. Read on to know our 5 best picks! Aadesh Coffee Shop, standing for a solid 14 years, is a place that you should visit for a quick yet filling snack. This stall serves a number of dishes from pav-bhaji to sandwiches to coffees. But their bestseller and also our favourite is the ‘breadcrumbs with cheese’. A combination of bread crumbs, spices and tomato ketchup, this is a wholesome snack in itself. It is topped off with an ample amount of cheese. Priced at INR 60, it is difficult for one person to finish this dish. Well, we cannot get over this amazing dish served at Sam Coffee Shop. We tried their ‘cheese masala pav’ and it left us wanting more. Freshly prepared, the masala made with onions, capsicum, coriander and spices was put atop a pair of nicely grilled pavs. Topped off with cheese, this dish is an absolute winner. At INR 50, this dish is slightly over-priced as compared to its quantity. Cold coffees are an absolute delight, never-mind the season. While it was slightly drizzling, we couldn’t ask for a more refreshing drink than the cold coffee served by Café Rudra. The concoction includes milk and coffee garnished with chocolate powder as well as chocolate syrup. The quantity is just right and priced at INR 30; it is a glass-full of goodness. For all you chocolate-lovers, if you want, the owner is sweet enough to add extra chocolate syrup to your drink! Although sold by most of the food stalls, we found tawa pulav most appealing at Sarovar Coffee House. The dish is a combination of cooked rice, a mix of veggies like onion, capsicum, tomato and peas, various condiments, a lingering taste of butter and topped off with an abundance of coriander. Priced appropriately at INR 60, this dish is a must-try. Our next (and final) stop was at Coffee Stop, which ironically is the first stall of the khao galli. As it’s said, save the last for the best, chocolate sandwich from this shop is, by far one of the best we’ve ever had. The best part of this stall is that they use brown bread for their sandwiches. A stack of 3 slices of bread is layered with gooey chocolate sauce and grilled to perfection. A little more chocolate sauce is added on top, which we don’t mind at all. End your food trail on a sweet note with this delectable chocolate sandwich for INR 50 from this 15-year-old food stall. There are many more food stalls here that serve pizzas, grilled sandwiches, anda-bhurji and many South-Indian dishes. Also, most shops here accept Paytm, therefore you don’t need to worry about keeping cash handy.